graphene_TOB is the NanoTCAD ViDES class for computing transport in a graphene FET through an analytical top-of-the-barrier model. The simulated device is a double gate device solved through the ballistic transport limit with an infinite long channel. The structure is depicted in the picture below. 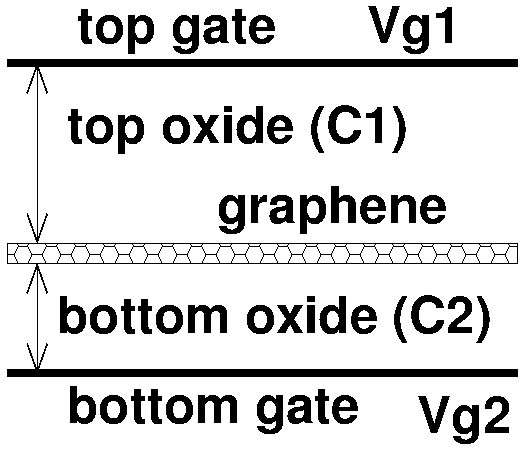 As inputs it requires top and bottom capacitance per unit surface (C1 and C2, respectively), top and bottom gate voltages (Vg1 and Vg2), drain-to-source voltage (Vds), and the initial solution for the potential in correspondence of graphene pot_ini. charge_I: (method)It returns three doubles: the potential in correspondence of graphene (V), the current (A/m) and the charge in the graphene layer (1/m^2).